Ms Koi said she was humbled and grateful for the opportunity given by International Maritime Organisation (IMO) to represent the association in such international discussion. Fiji’s inclusion in the third World Maritime University International Women’s Conference in Sweden next month is in recognition of Fiji Women in Maritime Association’s positive growth and contribution at all levels. FJ WIMA president Jane Koi made the comment following her nomination to represent Fiji to the April 4-5 conference. Government representatives, high profile personnel from worldwide port, ocean and fishing sectors, United Nations agencies, academia, research institutes, non-governmental organisations (NGOs) and other stakeholders converge for the conference to address gender gap in the maritime, ports, fishing and related industries. “This representation is a recognition of Fiji WIMA’s positive growth and contribution nationally, regionally and internationally to achieving its key objectives,” Ms Koi said. 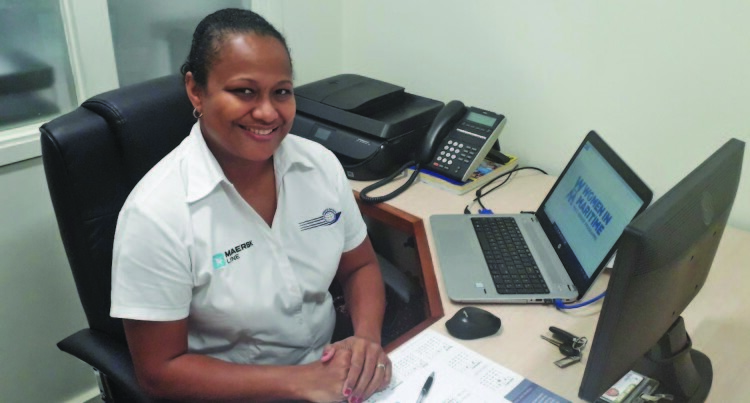 “For Pacfic WIMA, the inclusivity and connecting with other WIMA’s to share on good practical experiences would add value,” she said. She saysd she hopes to create positive conversational spaces on how to close the gender gap that is evident at all levels in Fiji’s maritime community and supporting the Sustainable Development Gap five and its sustainability. “I hope to connect with educational, training and employment opportunities and also seek funding assistance to support the ongoing programs each State WIMA in the Pacific region can embark on. “At present, only PacWIMA’s Vice President, Teina MacKenzie (Cook Islands WIMA rep and Pacific WIMA member) and I, Fiji WIMA President are nominees for the Pacific region and fully endorsed by our main body, Pacific WIMA. “There is a special 3rd individual, Ore Toua who is from PNG but based locally in Fiji at SPC as its Maritime Training Advisor. A side event is planned for all WIMAs to converge to discuss, share ideas and highlight issues that will support and empower women in the maritime community. She added that as a participant and representative of the Pacific region, it is anticipated that aligning Pacific WIMA’s regional strategy to promote and empower women in the maritime community at all levels of capabilities will have positive impacts that would support the objectives Pacific WIMA commits too, for example, the Day for Women In Maritime (D4W⚓M)which will be celebrated in the Pacific on May 18.